The pulp, or endodontium, is the part in the center of a tooth made up of living connective tissue and cells called odontoblasts. The dental pulp is a part of the dentin–pulp complex (endodontium). The vitality of the dentin-pulp complex, both during health and after injury, depends on pulp cell activity and the signaling processes that regulate the cell's behavior. The pulp is the neurovascular bundle central to each tooth, permanent or primary. It comprises a central pulp chamber, pulp horns, and radicular canals. The large mass of pulp is contained within the pulp chamber, which is contained in and mimics the overall shape of the crown of the tooth. Because of the continuous deposition of dentin, the pulp chamber becomes smaller with age. This is not uniform throughout the coronal pulp but progresses faster on the floor than on the roof or side walls. Radicular pulp canals extend down from the cervical region of the crown to the root apex. They are not always straight but vary in shape, size, and number. They are continuous with the periapical tissues through the apical foramen or foramina. The total volumes of all the permanent teeth organs is 0.38cc and the mean volume of a single adult human pulp is 0.02cc. Accessory canals are pathways from the radicular pulp, extending laterally through the dentin to the periodontal tissue seen especially in the apical third of the root. Accessory canals are also called lateral canals because they are usually located on the lateral surface of the roots of the teeth. The pulp has a background similar to that of dentin, because both are derived from the dental papilla of the tooth germ. During odontogenesis, when the dentin forms around the dental papilla, the innermost tissue is considered pulp. The central region of the coronal and radicular pulp contains large nerve trunks and blood vessels. Pulpal core, which is in the center of the pulp chamber with many cells and an extensive vascular supply; except for its location, it is very similar to the cell-rich zone. Cell rich zone; which contains fibroblasts and undifferentiated mesenchymal cells. Cell free zone (zone of Weil) which is rich in both capillaries and nerve networks. Odontoblastic layer; outermost layer which contains odontoblasts and lies next to the predentin and mature dentin. Cells found in the dental pulp include fibroblasts (the principal cell), odontoblasts, defence cells like histiocytes, macrophage, granulocytes, mast cells and plasma cells.The nerve plexus of Raschkow is located central to the cell-rich zone. The plexus of Raschkow monitors painful sensations. By virtue of their peptide content they also play important functions in inflammatory events and subsequent tissue repair. There are two types of nerve fiber that mediate the sensation of pain: A-fibers conduct rapid and sharp pain sensations and belong to the myelinated group, whereas C-fibers are involved in dull aching pain and are thinner and unmyelinated. The A-fibers, mainly of the A-delta type, are preferentially located in the periphery of the pulp, where they are in close association with the odontoblasts and extend fibers to many but not all dentinal tubules. The C-fibers typically terminate in the pulp tissue proper, either as free nerve endings or as branches around blood vessels. Sensory nerve fibers that originate from inferior and superior alveolar nerves innervate the odontoblastic layer of the pulp cavity. These nerves enter the tooth through the apical foramen as myelinated nerve bundles. They branch to form the subodontoblastic nerve plexus of Raschkow which is separated from the odontoblasts by a cell-free zone of Weil, therefore this plexus lies between the cell free and cell rich zones of the pulp. The primary function of the dental pulp is to form dentin (by the odontoblasts). Formative: cells of the pulp produce dentin which surrounds and protects the pulpal tissue. The health of the dental pulp can be established by a variety of diagnostic aids which test either the blood supply to a tooth (Vitality Test) or the sensory response of the nerves within the root canal to specific stimuli (Sensibility Test). Although less accurate, Sensibility tests, such as Electric Pulp Tests or Thermal Tests, are more routinely used in clinical practise than vitality testing which require specialised equipment. A healthy tooth is expected to respond to sensibility testing with a short, sharp burst of pain which subsides when the stimuli is removed. An exaggerated or prolonged response to sensibility testing indicates that the tooth has some degree of symptomatic pulpitis. A tooth which does not respond at all to sensibility testing may have become necrotic. In a healthy tooth pulp, the pulp is well-protected from infection by the enamel and dentin layers. A mild to moderate inflammation of dental pulp caused by any momentary irritation or stimulant whereby no pain is felt upon removal of stimulants. The pulp swells when the protective layers of enamel and dentine are compromised. Unlike irreversible pulpitis, the pulp still gives a regular response to sensibility tests and inflammation resolves with management of the cause. There is no significant radiographic changes in the periapical region hence further examination is mandatory to ensure that the dental pulp has returned to its normal healthy state. Pulpitis is established when the pulp chamber is compromised by bacterial infection. Irreversible pulpitis is diagnosed when the pulp of the tooth is inflamed and infected beyond the point of no return, healing of the pulp is not possible. Removal of the aetiological agent will not permit healing and often root canal treatment is indicated. Irreversible pulpitis is commonly a sequel to reversible pulpitis when early intervention is not taken. It is key to note that in this stage of the disease progression, the pulp is still vital and vascularised; it is not classified as ‘dead pulp’ until necrosis occurs. Irreversible and reversible pulpitis are differentiated from each other based on the various pain responses that they have to thermal stimulation. If the condition is reversible then the pulp's pain response will last momentarily upon exposure to cold or hot substances; a few seconds. However, if the pain lingers from minutes to hours, then the condition is irreversible. This is a common presenting complaint that facilitates diagnoses before further investigations e.g. sensibility tests and peri-apical radiographs are proceeded. Diagnosis of irreversible pulpitis is branched into two sub-divisions: symptomatic and asymptomatic. Asymptomatic irreversible pulpitis is a transition of symptomatic irreversible pulpitis into to an inactive and quiescent state. This is due to the nature of its causation; the inflammatory exudate can be quickly removed e.g. through a large carious cavity or previous trauma that caused painless exposure of pulp. It is the build-up of pressure in a confined pulp space that stimulates nerve fibres and initiates pain reflexes. When this pressure is relieved, pain is not experienced. As the names imply, these diseases are largely characterised by the symptoms they present, duration and location of pain, causing and relieving factors. A clinician's role is to gather all this information systematically. This will be a compilation of clinical tests (cold ethyl chloride, EPT, hot gutta percha, palpation), radiographic analysis (peri-apical and/or cone beam computed tomography) and any further tests deemed necessary. Thermal tests are subjective by nature, so performed on not only the compromised tooth, but the adjacent and contra-lateral teeth as well, allowing the patient to compare information and give the clinician more accurate responses. Normal healthy teeth are used as a baseline for diagnoses. - Very spontaneous and unpredictable pain. Can occur at any time of day and specific causing factors cannot be labelled. - Patient may complain of sharp lingering pains, that last longer than 30 seconds even after removal of stimulus. - As the bacteria have not yet progressed to the peri-apical region, there is no pain on percussion. Treatments: Require endodontic (root canal) treatment or tooth extraction. In endodontic therapy, removal of the inflamed pulp relieves the pain. The empty root canal system is then obturated with Gutta-Percha which is a rubber material that acts as a pressure and pain reliever. Pulp acts as a security and alarm system for a tooth. Slight decay in tooth structure not extending to the dentin may not alarm the pulp but as the dentin gets exposed, either due to dental caries or trauma, sensitivity starts. The dentinal tubules pass the stimulus to odontoblastic layer of the pulp which in turns triggers the response. This mainly responds to cold. At this stage simple restorations can be performed for treatment. As the decay progresses near the pulp the response also magnifies and sensation to a hot diet as well as cold gets louder. At this stage indirect pulp capping might work for treatment but at times it is impossible to clinically diagnose the extent of decay, pulpitis may elicit at this stage. Carious dentin by dental decay progressing to pulp may get fractured during mastication (chewing food) causing direct trauma to the pulp hence eliciting pulpitis. The inflammation of the pulp is known as pulpitis. Pulpitis can be extremely painful and in serious cases calls for root canal therapy or endodontic therapy. Traumatized pulp starts an inflammatory response but due to the hard and closed surroundings of the pulp pressure builds inside the pulp chamber compressing the nerve fibres and eliciting extreme pain (acute pulpitis). At this stage the death of the pulp starts which eventually progresses to periapical abscess formation (chronic pulpitis). The pulp horns recede with age. Also with increased age, the pulp undergoes a decrease in intercellular substance, water, and cells as it fills with an increased amount of collagen fibers.This decrease in cells is especially evident in the reduced number of undifferentiated mesenchymal cells. Thus, the pulp becomes more fibrotic with increased age, leading to a reduction in the regenerative capacity of the pulp due its loss of these cells. Also, the overall pulp cavity may be smaller by the addition of secondary or tertiary dentin, thus causing pulp recession. The lack of sensitivity associated with older teeth is due to receded pulp horns, pulp fibrosis, addition of dentin, or possibly all these age-related changes; many times restorative treatment can be performed without local anesthesia on older dentitions. Pulp necrosis describes when the pulp of a tooth has become necrotic. The pulp tissue is either dead or dying, this may be for a number of reasons including: untreated caries, trauma or bacterial infection. It is often subsequent to chronic pulpitis. Teeth with pulp necrosis will need to undergo root canal treatment or extraction to prevent further spread of infection which may lead to an abscess. Pulp necrosis may be symptomatic or asymptomatic for the patient. If the necrosis is symptomatic it could result in lingering pain to hot and cold stimuli, spontaneous pain that may cause a patient to wake up during sleep, difficulty with eating and being tender to percussion. If the necrosis is asymptomatic it will be non-responsive to thermal stimuli or electric pulp tests, the patient may even be unaware of the pathology. If the pulpal necrosis is asymptomatic it may go unnoticed by the patient and so a diagnosis may be missed without the use of special tests. To determine if pulp necrosis is present a dentist may take radiographic images (X-rays) and sensitivity testing e.g. hot or cold stimuli (using warm gutta percha or ethyl chloride); or they may use an electric pulp tester. Vitality of a tooth, which refers to blood supply to a tooth, may be assessed using doppler flowmetry. Sequelae of a necrotic pulp include acute apical periodontitis, dental abscess, or radicular cyst and discolouration of the tooth. If a necrotic pulp is left untreated it may result in further complications such as infection, fever, swelling, abscesses and bone loss. Currently there are only two treatment options for teeth which have undergone pulpal necrosis. Future treatments aim to assess revascularisation of pulp tissue using techniques such as cell homing. ^ a b c Illustrated Dental Embryology, Histology, and Anatomy, Bath-Balogh and Fehrenbach, Elsevier, 2011, page 164. ^ a b c James L. Gutmann, Paul E. Lovdahl (2011). Problem Solving in the Diagnosis of Odontogenic Pain in problem solving in endodontics (Fifth Edition). ^ a b Michaelson P, Holland G (2002). "Is pulpitis painful?". International Endodontic Journal. 35 (10): 829–832. doi:10.1046/j.1365-2591.2002.00579.x. ^ a b c d e f "Endodontic diagnosis" (PDF). American Association of Endodontics. 2013. ^ a b c d Glickman G, Schweitzer J (2016). "universal classification in endodontic diagnosis". Journal of Multidisciplinary Care. ^ a b c d Hedge, Jayshree (2008). Prep Manual for Undergraduates: Endodontics. India: Reed Elsevier India Private Limited. p. 29. ISBN 978-81-312-1056-7. ^ "Endodontic Diagnosis" (PDF). American Association of Endodontics. Retrieved 14 March 2018. ^ Chen, Eugene; Abbott, Paul V. (2009). "Dental Pulp Testing: A Review". International Journal of Dentistry. 2009: 365785. doi:10.1155/2009/365785. PMC 2837315. PMID 20339575. ^ Agnihotry, Anirudha; Fedorowicz, Zbys; Van Zuuren, Esther J.; Farman, Allan G.; Al-Langawi, Jassim Hasan (2016). "Antibiotic use for irreversible pulpitis". Cochrane Database of Systematic Reviews. 2: CD004969. doi:10.1002/14651858.CD004969.pub4. PMID 26886473. 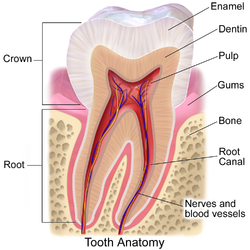 ^ "Root canal treatment (endodontic therapy) explained: What is it? Why is it needed? What does it do?". ^ "Differential Diagnosis of Toothache Pain: Part 1, Odontogenic Etiologies | Dentistry Today". www.dentistrytoday.com. ^ a b "Endodontic diagnosis: If it looks like a horse". www.dentaleconomics.com. ^ Jafarzadeh, H. (June 2009). "Laser Doppler flowmetry in endodontics: a review". International Endodontic Journal. 42 (6): 476–490. doi:10.1111/j.1365-2591.2009.01548.x. PMID 19459999. ^ Nusstein, John M.; Reader, Al; Drum, Melissa (April 2010). "Local Anesthesia Strategies for the Patient With a "Hot" Tooth". Dental Clinics of North America. 54 (2): 237–247. doi:10.1016/j.cden.2009.12.003. PMID 20433976. ^ "Pulp Necrosis: Symptoms, Tests, Causes, Risks, and Treatments". Healthline. February 2018. ^ a b Eramo, S.; Natali, A.; Pinna, R.; Milia, E. (April 2018). "Dental pulp regeneration cell homing". International Endodontic Journal. 51 (4): 405–419. doi:10.1111/iej.12868. ^ Oxford, Matthew (1 January 2014). "Tooth trauma: pathology and the treatment options". In Practice. 36 (1): 2–14. doi:10.1136/inp.f7208. ISSN 0263-841X.